Butterflies and moths, both from same insect group called Lepidoptera. Unlike butterflies, it is hard to see the moths. Because, most of them are nocturnal. The bad news is, a large number of moths are as beautiful as butterflies, and some are even more beautiful. 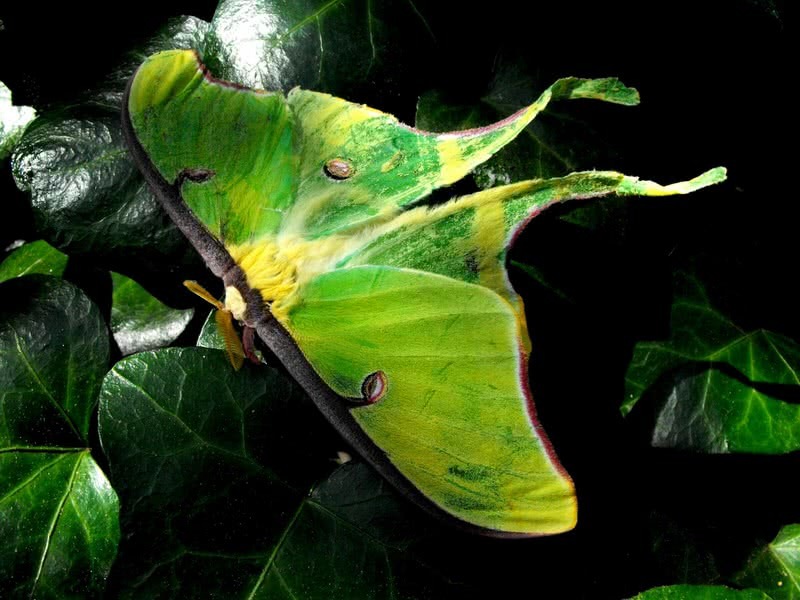 Here the list of 10 most beautiful moths in the world. 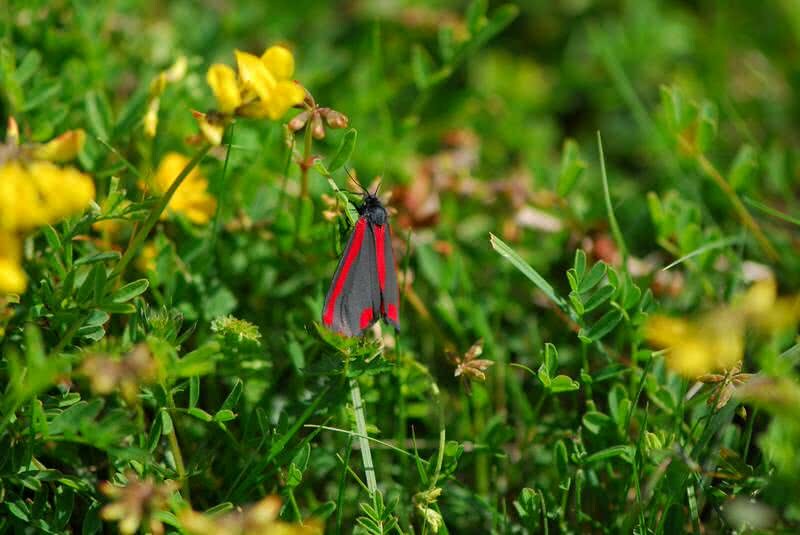 Cinnabar moth is a beautiful, brightly colored moth found across the Europe This moth is known for its red markings on forewings and scarlet hindwings. They live in meadows, wastelands, and downlands. With bright orange body, the larvae of cinnabar moth are as colorful as an adult moth. They feed on poisonous ragwort leaves. The bright color of larvae is a warning to their potential predators. When emerge as a moth, this species has a body length up to 30 mm and a wingspan between 35 and 45 mm. These moths are mostly active at night. But they also can be seen during the daytime. 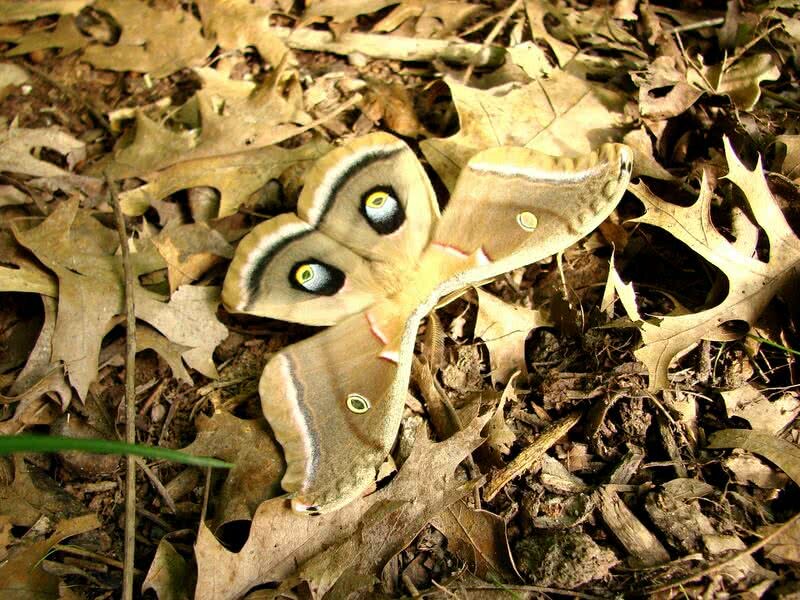 Polyphemus is an attractive, large silk moth found across America. The wingspan of polyphemus moth has a length of 15 cm. Their wings are not just lengthy but also colorful with shades of red, gray and brown. Polyphemus is an easily identifiable moth with its striking eyespots on both fore and hindwings. The hindwing eyespots are large which predominantly yellow in color with black-white rings. The forewings eyespots are small, and they are also yellow in color. Tau Emperor is a gorgeous, forest-dwelling moth found across Eurasia. This large moth has a wingspan between 60 and 84 mm. Male tau emperors can be seen during the daytime. But females become only active at night. Their wings are a mix of light brown and white colors. There are also eyespots on both fore and hindwings. The hindwing eyespots are large compared to forewing eyespots. 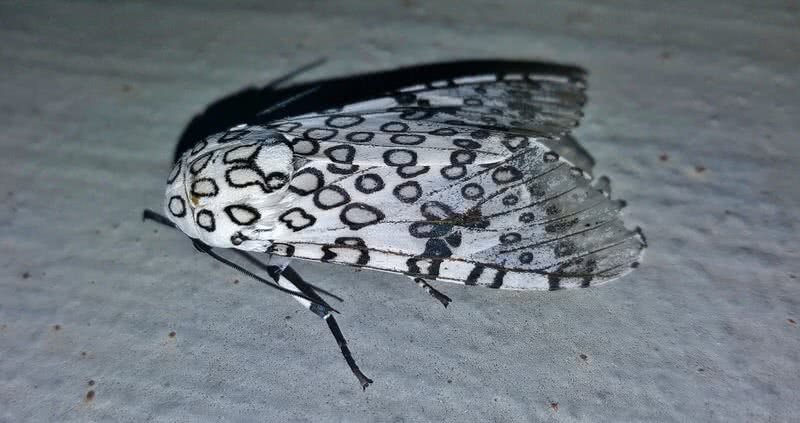 Giant leopard moth is famed for its stunning coloration – bluish black blotches on bright white wings. This lovely moth is also known as eyed tiger moth. Leopard Moths also have an impressive size. An adult moth has a body length of 2 inches and a wingspan up to 3 inches. Giant leopard moths inhabit in woodlands, farmlands, and gardens across the Americas. It is quite hard to see them as these beautiful moths are strictly nocturnal. 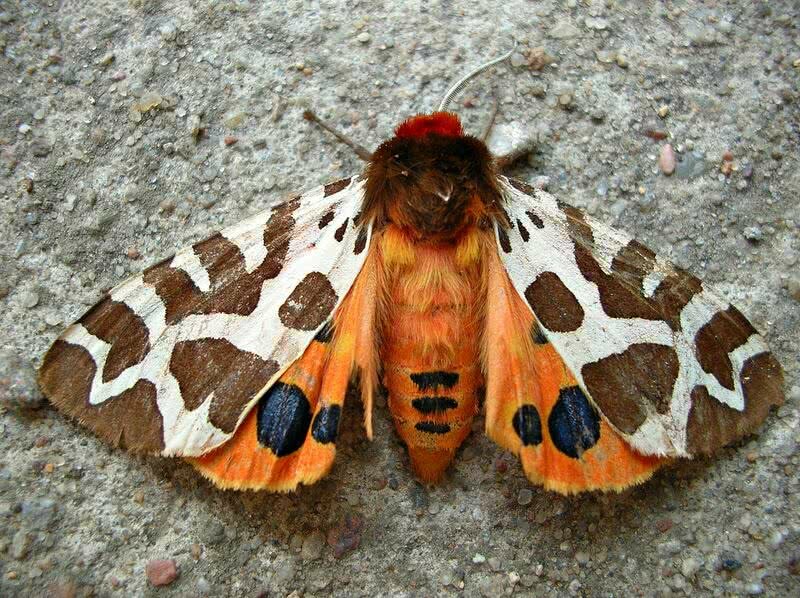 Garden Tiger is a strikingly colorful moth found throughout Eurasia and North America. Most attractive feature of garden tiger moths is orange hindwings with many black spots. Their forewings are white with beautiful black markings. The attractive coloration and patterns on the hindwings of a garden tiger may seem very appealing. But they are a warning to their predators. When threatened, garden tiger moths display their colorful hind wings. If the threat persists, they will secrete a poisonous fluid from the body. Probably the most attractive member of hawk moth family which comprises 1450 species. 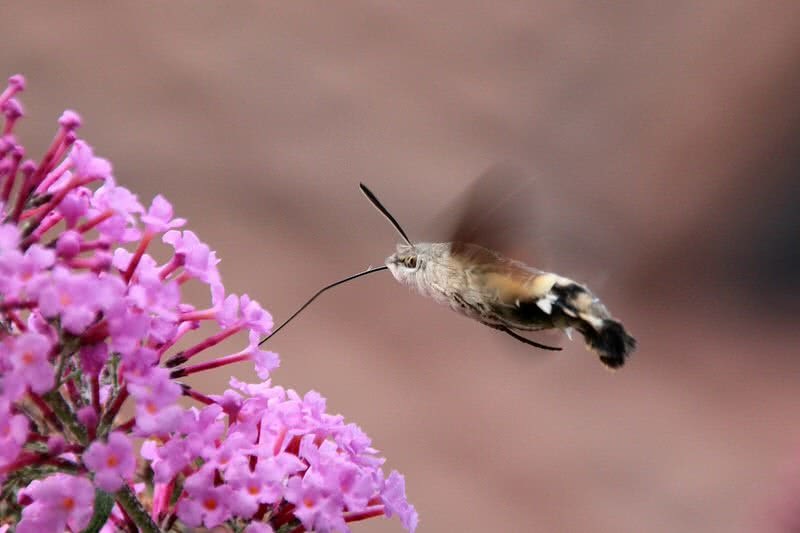 Hummingbird hawk moth is named so because of their feeding behavior similar to hummingbirds, with their long proboscis or nose. These moths also hover over flowers and make ‘humming noise’ just like hummingbirds. They live in various habitats across woodlands, grasslands, farmlands, gardens and forests across Europe, Africa, Asia, and Russia. It’s a medium to the large sized moth. An adult moth has a wingspan of 50 – 58 mm. Hummingbird hawk moths have grayish – brown forewings and orange hindwings. Their colorful hind wings become evident in their rapid flight. 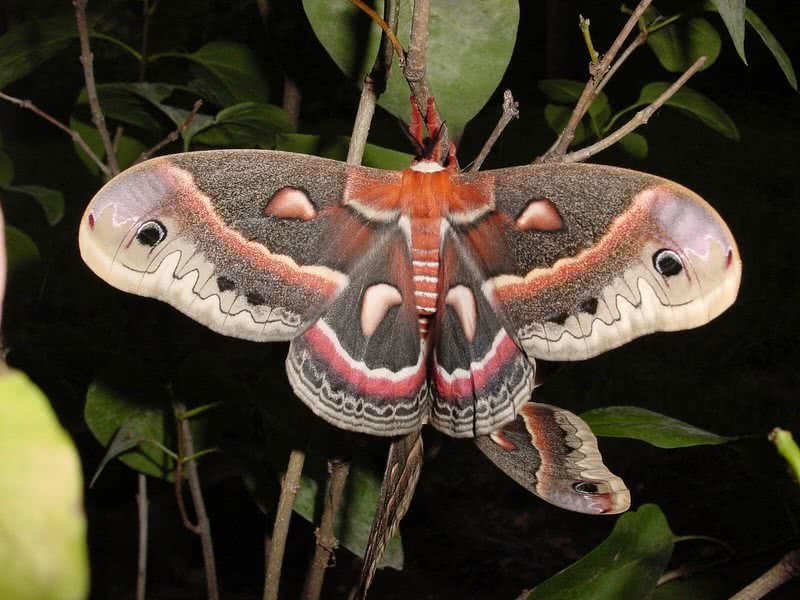 With a wingspan of 5 – 6 inches, the Cecropia moth is the largest moth of North America. 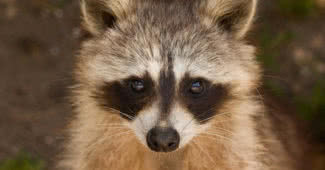 They are known for large size and brilliant coloration. 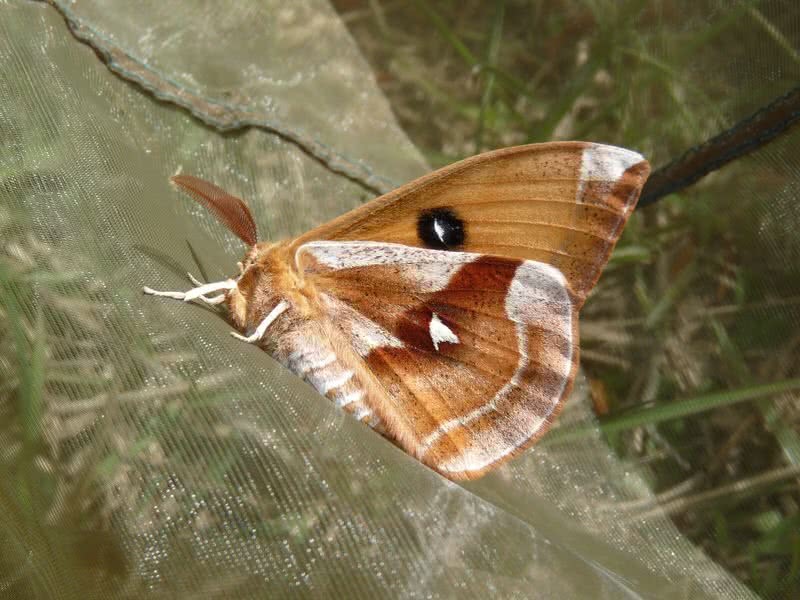 This beautiful moth has a reddish body and reddish – brown wings with bands of white and tan. Cecropia moths found mostly in rocky mountains of the United States and Canada. But, it is hard to spot them as they are only active at night. 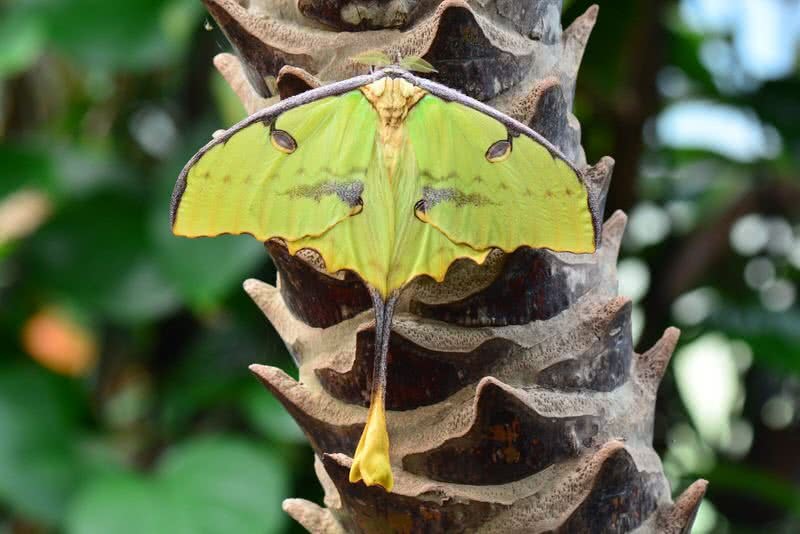 Native to rainforests of Madagascar, it is one of the largest silk moths in the world. This beautiful moth is also known as comet moth. Most attractive feature of comet moth is its long red tail which measures up to 15 cm. Luna moth is a large, strikingly colorful moth found in deciduous hardwood forests of Canada, United States, and Mexico. The wingspan of this impressive moth extends over 4.5 inches. The coloration of Luna moths is as eye-catching as it’s size. They have broad, green colored wings. There are also striking eyespots on both fore and hindwings. Wings are not entirely green. The edges of wings have rust color. They also have long, curvy tails on each hindwing. 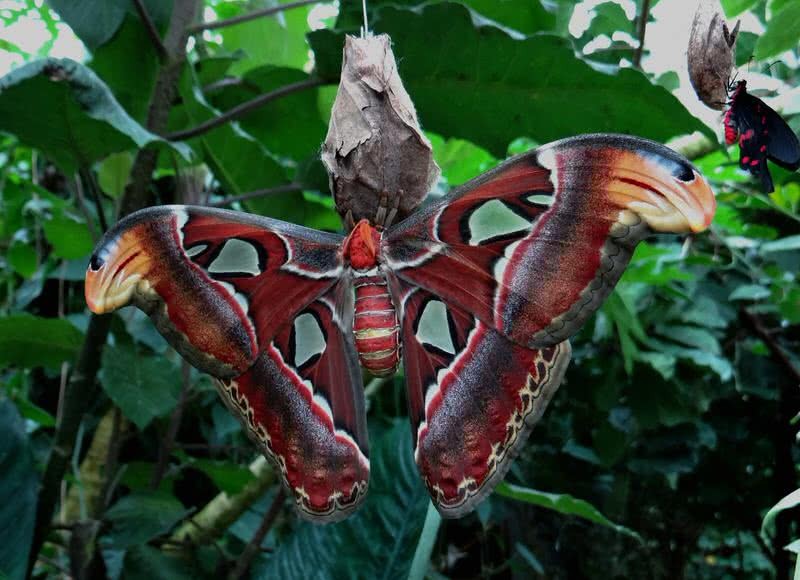 Atlas moth is the largest and probably the most beautiful moth in the world. An adult Atlas moth has a wingspan of 11 inches and a surface area of 62 square inches. They live in tropical and subtropical forests of Southeast Asia. The fore and hindwings of Atlas moths are rusty brown with outlines of yellow, purple, black and red. With impressive pattern, the wingtips of Atlas moth resembles snake head. They may use it to scare off the potential predators.